52 Weeks #22: Working on my first cutting board. So one of the things I like about this hobby is there is always something new to try and for a person that has a hard time with doing the same thing constantly that is a good thing. The problem with that is there is always something new and I have not yet found one thing to focus one, I am not sure if that is a good thing or not. But until I figure it out I am pretty happy trying as much as I can. That being said I have decided to tackle a cutting board. My first one is to be for a gift and will only be a small one for cheese and such. I am hoping to make a wine bottle balancer to go with it. I started earlier this week in putting stuff together and got a fair amount of time to work on it this weekend, need to do a lot more sanding and of course finishing before the middle of the week. 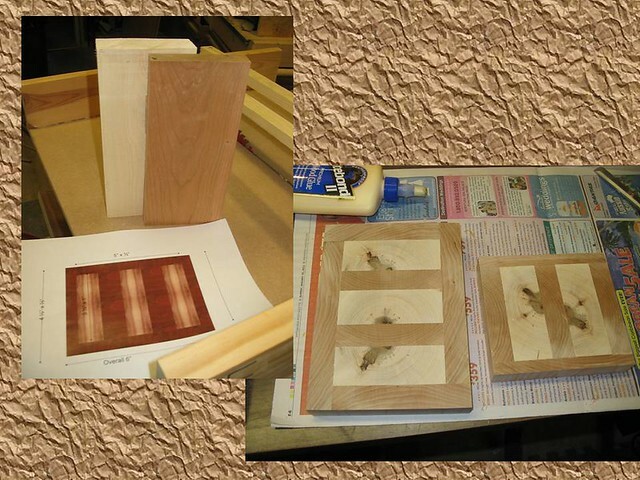 I laid the idea out in PowerPoint as always and decided to use Maple and Cherry. The maple is actually a resaw that I worked on and the cherry I had picked up at the last woodworking show. I am pretty excited about using wood that I cut myself and trying to make sure things turn out good. I had some extra leftover so I decided to make the smaller board, if nothing else it will allow me to experiment with the finshing process some more. The balancer is started but has plenty of work to be done as I am going to make it out of the same two woods. I do want to thank all of those here at LumberJocks that have given a lot of inspiration for doing not only this cutting board but a lot of my projects. You all truly help me see different ideas and things that are possible. Hope everyone has a great week in the shop. I love the spalting on the maple. Really cool stuff.